Designed and constructed by 4th and 5th graders from Marine Elementary School, their families and other community members, with artist Karron Nottingham. From Stillwater: Hwy 95 north 12 miles, turn east onto Maple Street, south on Judd Street. Go one block to Marine Mill Site Park. Bench is just south of the Park entrance. If you’re looking for somewhere to sit in the woods along the St. Croix River, and there isn’t a seat in sight, what might you sit on? 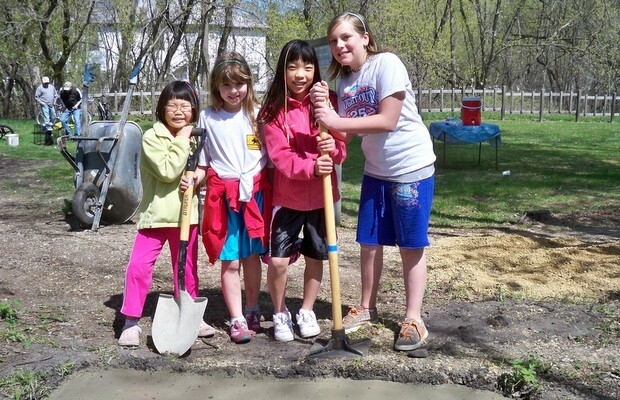 A tree stump will do, answered the kids involved in the Marine on St. Croix Bench Project. The third- and fourth-graders from Marine Elementary School were ideal collaborators, says artist Karron Nottingham. “It’s an age when they can communicate well verbally and non-verbally, like drawing pictures,” Nottingham says. The fourth-graders were also studying the history of Marine, Minnesota, and the St. Croix River, so a sense of place was already growing in their imaginations. The kids started drawing. They came up with ladybugs, beavers, turtles, dragonflies, foxes, and other creatures. Their drawings were almost all simple lines and shapes, and Nottingham said it reminded her of Native American pictographs, which can still be seen on rocks along the river. Those drawings now adorn the bench, retaining the spirit of their original creators. The designs inspired clay sculptures the children made, and then those were recreated around the edge of the bench’s seat. When it came time to build the bench, the community helped bring the design to reality. Parents and other adults were invited to help build cement molds for the tree-stump shaped pillars that support the bench. 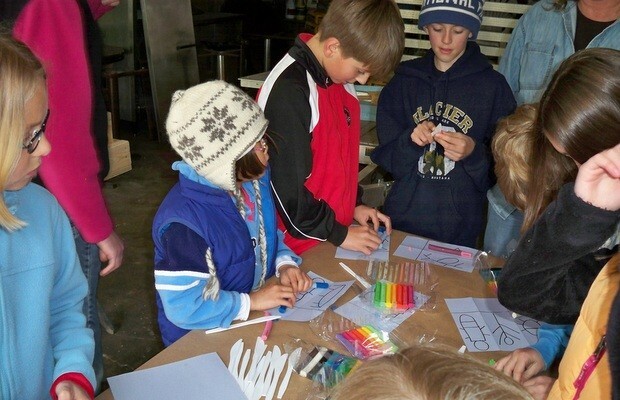 “It was really interesting working with parents and encouraging them to let the kids do it. They could be supportive, and I was there to facilitate and make sure children’s ideas didn’t get changed,” Nottingham said. 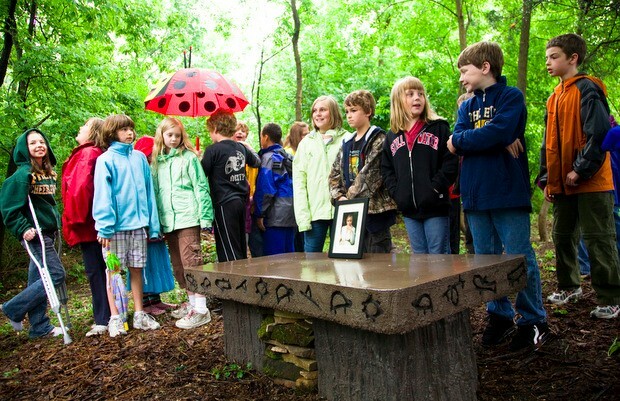 The bench serves as a memorial to Marine resident, teacher, mother, and arts champion Laura Johnson. Johnson passed away shortly before the Bench Project started. Her husband and children decided they would donate to the effort to honor her memory, recalls Robin Brooksbank, a local civic booster who connected them with the project. “The outreach to the community, the involvement in kids, and the emphasis on the natural environment in St Croix Valley were all very important to Laura,” Brooksbank said. The Art Bench was placed at the historic Marine Mill site, the location of Minnesota’s first commercial sawmill, which ran from 1839 to 1895. Today, the site is owned by the Minnesota Historical Society and operated by the city, which grew up around the mill during the lumber boom. A path winds through the mill ruins, with plaques explaining the different buildings that once stood there. At the entrance to the site, the bench invites visitors to sit on a couple of tree stumps just the right height for rest and reflection. Did you know that Native Americans were the first people to call the St. Croix River Valley home? You can still see the petroglyphs they drew on the rock cliffs along the river. 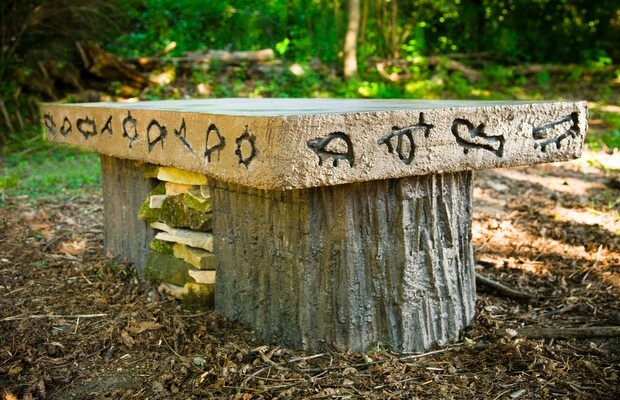 Look at the designs on this bench that were inspired by these drawings – what creatures do you see? Make up your own petroglyphs for other creatures or things you find in nature. Created by 4th and 5th grade students of Marine Elementary School and artist Karron Nottingham. With support from The Phipps Center for the Arts, the St. Croix Valley Foundation, the City of Marine, the Minnesota Historical Society, 4th and 5th grade families of Marine Elementary School and the Marine Restoration Society. In loving memory of Laura Ingersoll Johnson, honoring her life-long dedication to the arts.